Dog toys and cool gadgets. Pond Pumps, Air Pumps and Heat. EHEIM REEFLEX UV UVC MARINE EXTERNAL FILTER AQUARIUM STERILISER REEF FISH TANK. Please use the drop-down menu to select your preferred model. The following options are available from Aquacadabra. EHEIM Reeflex 350 UV Clarifier. 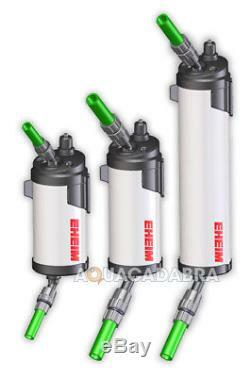 EHEIM Reeflex 500 UV Clarifier. EHEIM Reeflex 800 UV Clarifier. EHEIM Reeflex UV reduces microorganisms in the water and eliminates torpidity in the water better than ever before. Reeflex UV is yet another typical innovation from EHEIM: due to a built-in reflector the microorganism-killing UV-C radiation is significantly increased. And whereas in conventional UV-sterilisers the water is directed via detours past the UV-C burner, in the EHEIM Reeflex UV it takes the direct route. Thus there is no loss of performance. And the level of effectiveness is 1,8 times greater. Reeflex UV should only be used in support of the filter, in order to reduce small organisms microorganisms, algae spores etc. There are 3 models for aquariums from 80 up to 800 litres. Benefits of the EHEIM Reeflex UV. Quickly and effectively reduces microorganisms in the water. Eliminates torpidity caused by algae or bacteria. Internally fitted high gloss aluminium reflects the UV-C light and ensures extra efficient sterilisation. Excellent results with low energy consumption (1,8 times higher effectiveness than conventional UV-sterilisers). No performance loss, as the water is not redirected using a special design. Ideal also for breeder tanks, reduces risk of infection. Attached purification bacteria are retained in the filter, because only floating organisms are captured. Simple and safe maintenance and cleaning. AUTO-OFF: automatic safety cut-off when changing lamp. Simple fastening in or on cabinet or side of tank. Unfortunately couriers pass on aditional shiping charges for these locations which we have to pass on. There are many reasons to shop online with Aquacadabra. Having traded online for so many years, we were one of the original specialist online aquatic retailers. As such, we have a huge wealth of experience in online trading. At present we list nearly 5,000 specialist aquarium & pet products suitable for Aquatic, Reptile, Cat and Dog enthusiasts. All our items listed are UK spec. We're not just an online aquatic retailer, we are also a specialist aquatic retailer with a bricks and mortar warehouse located in Crayford, Kent, and you are very welcome to visit. Open six days a week and staffed by experienced aquarists with a love for the hobby, our staff don't just manage the welfare of our live stock on site, many also have tropical and marine aquariums at home. It is only by being enthusiasts for the hobby that a true understanding of fish husbandry can be obtained, whether it is understanding the requirements of your fish or knowing the appropriate piece of equipment that you require to succeed in the hobby. One final reason to shop with Aquacadabra is our inventory. When placing an order with us, you can rest assured we'll have the goods with you as quickly as we possibly can. We feel that offering a large inventory of products at competitive prices, tied to a high level of customer service and the reassurance that we are available for you 6 days a week for any fishy questions that you may have, Aquacadabra is the one stop shop for all of your aquatic reptile or pet needs. If an item over the specified value/weight is ordered to one of these locations, you will be subject to a &###xEF;&###xBF;&###xBD;6.90 surcharge from our courier. Our website features an extensive online Help section which covers all eventualities with orders; together with easy to complete forms to enable us to address any problems in as quick an efficient a time frame as possible. The item should be in an unopened and unused condition and you should notify us within 14 days that you wish to return the item to us. Please be aware that after bank holidays there is always a back log of orders for us to work through. Usually this is due to a courier being unable to locate an address, and unfortunately problems can from time to time be encountered when using any third party courier service. Please note that should a parcel be lost it takes 14 days before we can claim for the lost parcel. We will discuss the matter directly with you to ensure that you receive the minimum of inconvenience. Please do not send any faulty items to us directly as this may cause a significant delay in resolving the matter. We aim to resolve this type of problem in as timely a manner as possible. There are a number of circumstances when you may wish to cancel and/or return goods ordered. Once the Company has received and acknowledged your requirement, they will provide you with the necessary procedure which you must ensure is followed. Please also note it is your responsibility to get the item back to us at your cost in a new undamaged condition. When returning goods, we recommend that you use a courier or deliver them personally to our Head Office. The Company accepts no responsibility for damage that is incurred in transit when returning goods, or for goods that are lost in transit. Order Cancellation or Changes to Orders. Once an order has been placed it will be processed almost immediately. This means if you wish to cancel the order you will need to send the goods back to us once received. This listing is currently undergoing maintenance, we apologise for any inconvenience caused. The item "EHEIM REEFLEX UV UVC MARINE EXTERNAL FILTER AQUARIUM STERILISER REEF FISH TANK" is in sale since Thursday, September 19, 2013. This item is in the category "Pet Supplies\Fish & Aquarium\UV Steriliser". The seller is "aquacadabra" and is located in bexleyheath,kent. This item can be shipped to United Kingdom, United States, Japan, Canada, Ireland, Australia, Germany, France, Greece, Italy, Spain, Russian federation, Austria, Belgium, Bulgaria, Croatia, Cyprus, Czech republic, Denmark, Estonia, Finland, Hungary, Latvia, Lithuania, Luxembourg, Malta, Netherlands, Poland, Portugal, Romania, Slovakia, Slovenia, Sweden, Brazil, New Zealand, China, Israel, Hong Kong, Norway, Malaysia, Mexico, Singapore, South Korea, Switzerland, Thailand, Saudi arabia, South africa, United arab emirates, Ukraine, Chile.